In June of 1936, The Motor ran an article announcing the new MG T Series cars, replacing the venerable P types. By early 1939, Abingdon had produced the last of 3003 TA’s, which were the genesis of the entire T Series that ran until the late 40’s. This beautiful example, #0510, was completed on September 2, 1936, and survives today with just 58,000 original miles. The new TA of 1936 featured the Morris 1292cc overhead valve pushrod 4 cylinder engine, but fitted with twin bronze-bodied SU carbs, producing around 50 HP with plenty of torque. Also new to the marque were hydraulic brakes and a synchromesh 4 speed transmission. #0501 was delivered new to Anstey’s Motors, and the car still carries the medallion fitted when new. It was exported after WW II, first to New Jersey, then Florida, and eventually to the garage of Jack Spaulding, before purchase by the consignor in 2001. It was completely rebuilt from the block up by noted specialist Lee Johnson, with the transmission done by John Twist. In 2005 a correct new wiring harness was installed, and the car converted to the more user-friendly 12-volt system in place today. New brake lines, brakes, and tires were fitted in 2009. The car runs well, starts easily, and literally everything functions perfectly at this time, including all gauges, the original clock, and even the factory trouble light that plugs into the dash. The car is presented today with many spares straight from the UK, as well as many manuals, articles, receipts, and trophies from the past 12 years. There are 2 car covers included, custom-made lamp covers (the headlamp lenses are original and impossible to find), and both full and half tonneau covers. The top and side curtains are in excellent condition. All the original tools are included, and even the original key to the car. The paint on the car is believed to be original, although there is no proof, but many experts have verified the quality of the vintage lacquer, which survives with a nice shine and few flaws. The original red leather interior survives in fine condition, with just the right patina, with only the carpets needing replacement. The owner has added just over 8,000 miles on the odometer during his 12-year ownership, and has literally never allowed the car to get wet. The ash frame is excellent, and it is clear that the body has never been off the frame. 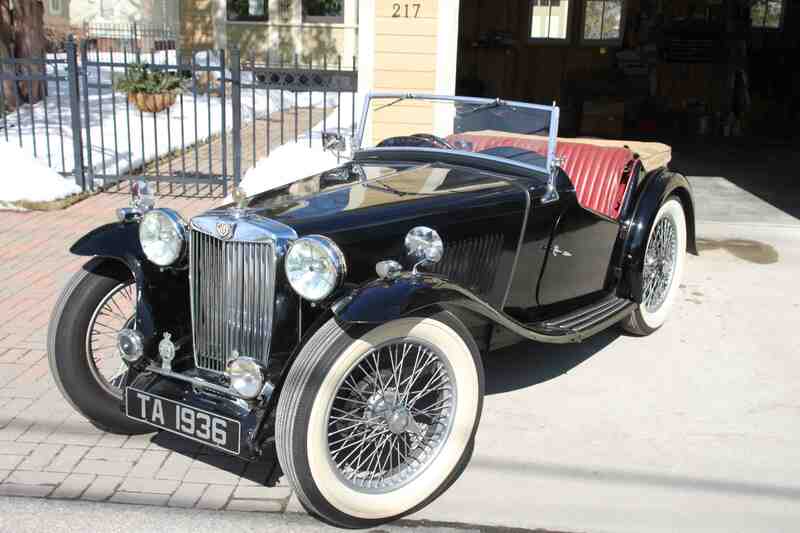 This is a real find for an MG collection – an early, documented car that is numbers matching, highly original and exceptionally cared for. It represents the beginning of the entire T-Series, which is widely credited with bringing sports cars to the attention of America, and is certainly one of the iconic designs to ever come out of Abingdon. If you have an early model MG or another collectible you’d like to insure with us, let us show you how we are more than just another collector vehicle insurance company. We want to protect your passion! Click below for an online quote, or give us a call at 800.678.5173.